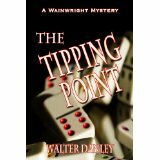 Debut novel, The Tipping Point by Walter Danley, begins with murder and continues from there with corporate greed, intrigue, conspiracy, suspense, and more. There are many questions that come up which the reader will want answered before reaching the last page. Even though there were a few contradictions in the story, sidetracks and extra information that drew the reader away from the main story, and times when it was hard to follow who was speaking, the main thread carried through. It was set in the 1970’s, so the reader may find some subtle sexism that seems to be accepted by the characters. Instead of my dwelling on the problems with the editing of this story, and inconsistencies which I hope have been corrected in the final edits, I would suggest – if you enjoy a novel such as I described in the first sentence of the above paragraph – you give this book, The Tipping Point, a try. You will meet Wainwright, who, after one of his partners is murdered, tries to uncover the corrupt undercurrent he discovers that prevails in their multimillion-dollar company. There are more deaths, threats, fraudulent dealings, love affairs, an illusive hit-man, and many well-developed characters to follow through it all. The Tipping Point is not a straightforward tale, but one that is tangled and interesting to read. It is fast-paced where needed, and dramatic. Even with my habit of noticing flaws as I read, this was a story I wanted to follow to the end. I’m usually a good guesser at ‘whodunit’, but this one kept me guessing as to whom was behind the murders and conspiracy. Readers will be satisfied with the ending Walter Danley wrote to The Tipping Point. Because of his fans’ requests, the author is working on a sequel. Visit Walter Danley’s website to view the trailer for The Tipping Point. You can find The Tipping Point listed on my BUY THE BOOK! page. This entry was posted in Mostly About Reading, Reviews & Interviews and tagged adult fiction, Book review, corporate crime, Mable Arch Communications, murder mystery, mystery, Novel, Walter Danley. Bookmark the permalink.